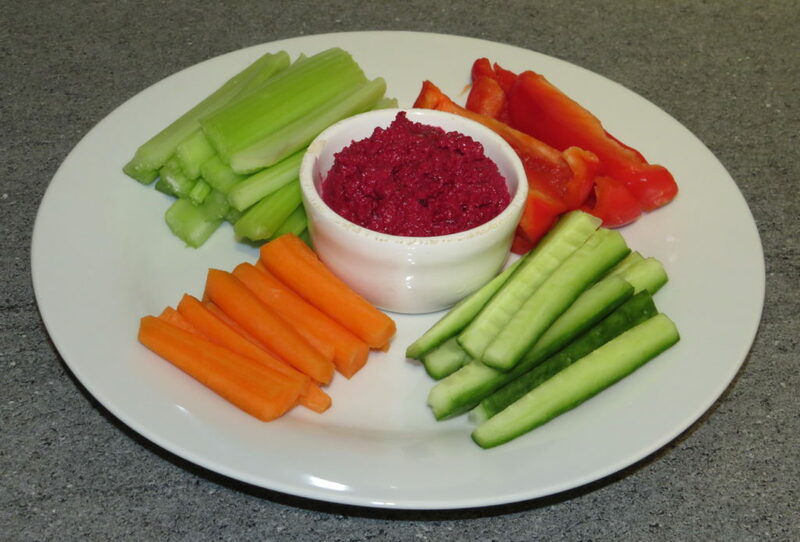 This dip is a variation of a hummus made without the chickpeas. Just like hummus it can be eaten as a dip with vegetable sticks, a dollop added to salads, vegetable kebabs or as part of a mezze platter. 1 Put the beet the beetroot on a flat baking tray and spray with the olive oil and massage so the beetroot is coated in the oil. Then place the tray into a pre-heated oven on 200c/400f/gas 6 for 20 minutes. When cooked set aside to cool. 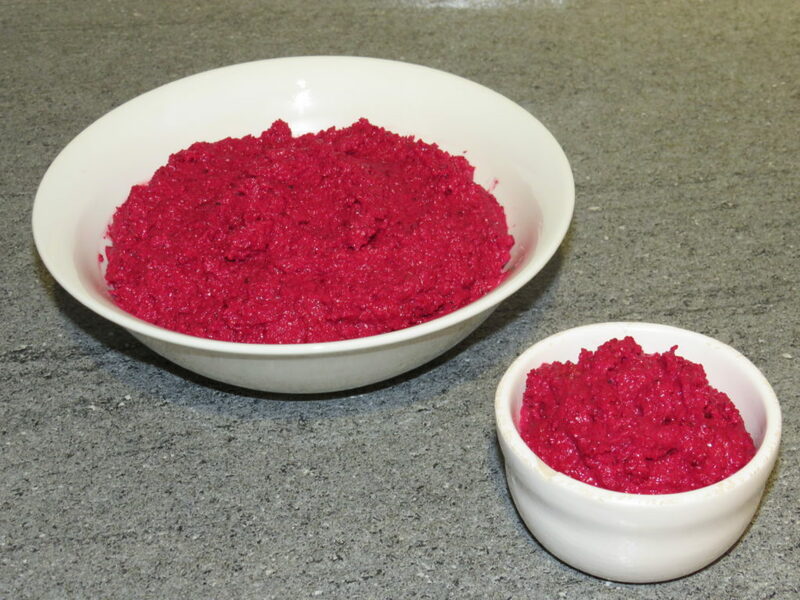 2 When the beetroot has cooled a little place it into a food processor along with the lemon juice, olive oil, garlic, black pepper and tahini then blitz for 10 seconds. 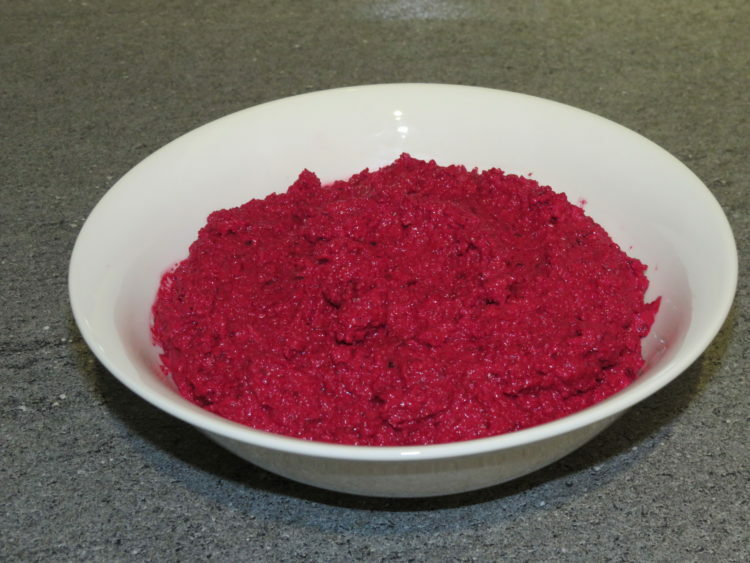 3 Then add 2 tbsp of water and blitz for 15 seconds, then add 1 tbsp of water blitz for 15 seconds and so on until all the water is used and it becomes a smooth dip. 4 It is now ready for you to enjoy. Tip: I like my dip a bit rustic, if like a smoother the dip add more water. You can keep in a sealable container and keep in the fridge for up to 7 days. Beetroot have a wide range of health benefits including the treatment of kidney disorders, dandruff, anaemia, indigestion, constipation, it is an aphrodisiac and helps prevent macular degeneration, improve blood circulation, lowers cholesterol, promotes hair growth and blemish free glowing skin and when juiced increases stamina. It also has a high sugar content the highest of all the vegetables, so watch your potion sizes if juiced only have one glass a day or eaten 1 potion (80g) per day. It is also rich in anti-oxidants, iron, potassium, manganese, magnesium, vitamin-A, vitamin-B6, vitamin-B9 and vitamin-C.
Tahini is a sesame paste which is very versatile and can be used in a number of dishes. Like sesame seeds it is great for immune support, a healthy heart, glowing skin, conditions and promotes hair growth, nullifies the affects of alcohol, assists weight loss, boosts energy and it has more protein than nuts and milk (dairy). It is a rich source of calcium, phosphorus, lecithin, magnesium, potassium, iron, vitamin-E, vitamin-B1, B2, B3, B5, and B15. Lemon Juice not only does it cleanse the body of toxins and radiation, it is well known for its antioxidants and anti-inflammatory benefits, it helps strengthen the immune system. It is also rich in vitamin-C which has anti-cancer properties, when drizzled on spinach or leafy greens it helps our body absorb the iron.